AmphiPro-Stress is a specially formulated blend of selected vitamins and electrolytes scientifically proven and tested to help fast recovery of sick animals and birds as a result of disease. AmphiPro-Stress's immediate replacement of electrolytes helps poultry and animals in avoiding and combating stress. AmphiPro-Stress aids in enhancing the physical fitness of poultry and animals and improves their resistance to disease. Stress to animals and poultry may result from very cold or very hot ambient temperatures, overcrowding and dense housing, excessive movement, transport, castration post-vaccination, and underfeeding and dehydration as a result of infectious diseases such as infectious gastroenteritis and other gastrointestinal diseases precipitating adverse consequences. 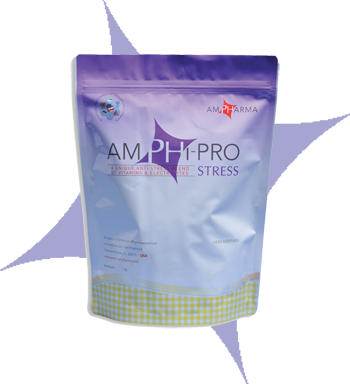 AmphiPro-Stress also helps in the process of absorption of antibiotics and other drugs by correcting the electrolyte imbalance resulting from diseases. AmphiPro-Stress is used as a supportive supplement to help alleviate the effects of stress for poultry and animals as a result of dehydration, diarrhea, infectious disease, post-vaccination stress, infectious gastroenteritis, fatigue and stress due to heat, cold and overcrowding, decreased feeding, and growth retardation. For oral administration as a source of vitamins and electrolytes. Chicks (more than 21 days): 1 kg / 2000 liters of drinking water for three to five days. Potassium Bicarbonate, Sodium Chloride, Calcium Acetate, Sodium Acetate, Silica Dioxide, Vitamin A, Mixed Synthetic Amino Acids, L-Lysine HCL, L- Threonine, Glycine, Vitamin D3, Vitamin E, Vitamin K, Thiamin, Pyridoxine, Folic Acid, Ascorbic Acid, Lactic Acid Bacteria Mix containing 5 Billion CFU of Lactobacillus Acidophilus, Lactobacillus Planterum, Bifidobacterium Bifidum, proprietary carrier, anti-caking agents, and other proprietary micro ingredients.